On November 10, 2009 I did a Q and A with director Oren Moverman, Ben Foster and Woody Harrelson after the NBR screening of The Messenger. Moverman is a wonderful craftsman of style and story and talked at length about shot set-ups and the importance of the long take to his story. Harrelson was tentative at first, wondering it seemed where I would be coming from. Once we got into film talk he perked up and became quite engaging. I asked Foster about his acting style, especially the way he seems to use space (and to close space) between himself and characters and he insisted that this was purely an instinctive element of his technique. The Messenger was written and directed by Oren Moverman, a screenwriter (I’m Not There, Jesus’ Son, Face) making his feature directing debut. Working with cinema-tographer Bobby Bukowski (Phoebe in Wonderland, The Stone Angel), Moverman has created a film that takes on controversy with a perfect balance of empathy and self-discovery. The Messenger opens with a closeup of an eye, overexposed to nearly white. A hand comes into frame and puts eyedrops onto the cornea, the drops spilling like tears. The damaged eye (and leg) belong to Montgomery, a “hero” soldier back from Iraq waiting for his new orders. Portrayed by Ben Foster, memorable as the charismatic villain in 3:10 to Yuma, Montgomery is an intense, troubled man attempting to define his moral bearings in a world that seems suddenly foreign. He is assigned to the Army Casualty Notification Services and feels completely unprepared. “I haven’t had grief counseling yet,” he says at the interview. This dismays his senior partner, Officer Tony Stone, played with a wound-up intensity by Woody Harrelson. Stone, as tough as nails, sees no grey areas in the job. There are rules that must be followed: you give the message and only the message; you act with honor; you walk away from any emotional or physical encounter. Harrelson and Foster play troubled men who remain honorable–even when tempted by personal demons. The structure of the film–six missions to six very different types of people–is brilliantly designed to challenge both men: Stone struggling to toe the military line of distance and formality, Montgomery fighting and ultimately giving in to his instinct to engage and comfort. 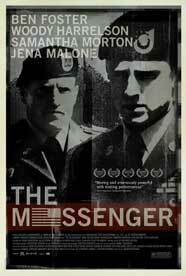 The Messenger is filled with transcendent moments of acting buttressed by a sense of reality that is raw and real. Moverman shoots long takes when his actors are at work, using both mobile hand-held camera and slow creeping dolly or zoom shots. The hand-held technique, which minimizes the editing process, allows the actor’s work to pick up momentum as it builds on each moment. The long-take aesthetic culminates in an emotional, suspenseful, and superbly played scene between Foster and Samantha Morton. The camera stays on them as they move about the tight sunlit kitchen of the small house the widow is about to leave, as they fall deeper into attraction even as they are saying goodbye. Moverman gives his outstanding cast members the chance to discover their characters though the unfiltered art of acting–not simply through creation and assemblage in the editing room. Every performance in the film feels authentic. Steve Buscemi does a star turn as a grieving father, unleashing a fierce and bitter attack on Montgomery from such a deep place that it sears the heart. Samantha Morton is both a devastated woman and determined survivor as the widow who compels Montgomery’s attention and ultimately gives him the strength to cope with his own pain. Each of the notification scenes is complete, dramatic, and painfully engaging. The Messenger is the rare film about war that takes an honest, realistic, and dramatic look at how soldiers cope with grief within themselves and in others, a journey of discovery, loss, and the long road back to happiness. This entry was posted in Film Reviews and tagged Ben Foster, Oren Moverman, The Messenger, Woody Harrelson by Thomas W. Campbell. Bookmark the permalink.